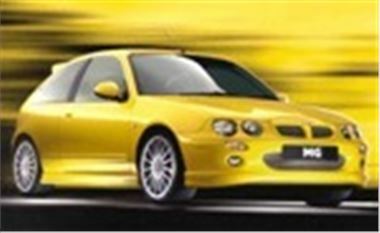 Rover has now announced July as the month for the reincarnation of its Rover 25, Rover 45 and Rover 75 as a range of MG sports saloons. Purists should not shudder. The original range of MGs were modified Morrises, so all the company is really doing is getting back to the roots of its sporting heritage. Unlike the hideous Farina bodied MG Magnettes of the 1960s, the new range of MGs are thoroughly re-engineered rather than merely badge-engineered. The 25 based ZR160 boasts the same 160bhp VVC engine as the MGF Trophy 160, with a 0-60 of 7.4 seconds and a top end of 131mph. List price is a reasonable £14,345. The 45 based ZS180 does the job slightly differently, using a 177bhp version of Rover's 2.5 litre KV6 to propel it to 60 in 7.3 seconds then on to a top whack of 139 for a list price of £16,395. While the 75 based ZT190 has the same engine boosted to 190bhp, getting the heavier car to 60 in 7.8 seconds and on to 141mph, which is easily handled by the much improved 75 chassis. This one is priced at £21,095. A ZT-T Touring estate car is also on the way. ZRs, ZSs and ZTs will also be available with smaller engines in lower states of tune from £9,995, £12,495 and £18,595 respectively. The new range should give the company a strong boost, and its widespread involvement in motor sport echoes the 1930's MG philosophy of "win on Sunday, sell on Monday". So fingers crossed that the MG Lolas entered for this years 24 hours at Le Mans in June will acquit themselves well.